The Norse Wind is Rising: HRH Vikings Festival II Announces Their Initial Shield Wall. The Second Coming is upon us: All hail HRH Vikings II. HRH – Europe’s leading residential provider – debuted HRH Vikings last weekend: a stage-storming, genre-crossing, alloy of five – count ‘em: FIVE! – forms of metal: Battle, Nordic, Pagan, Black, & Death. 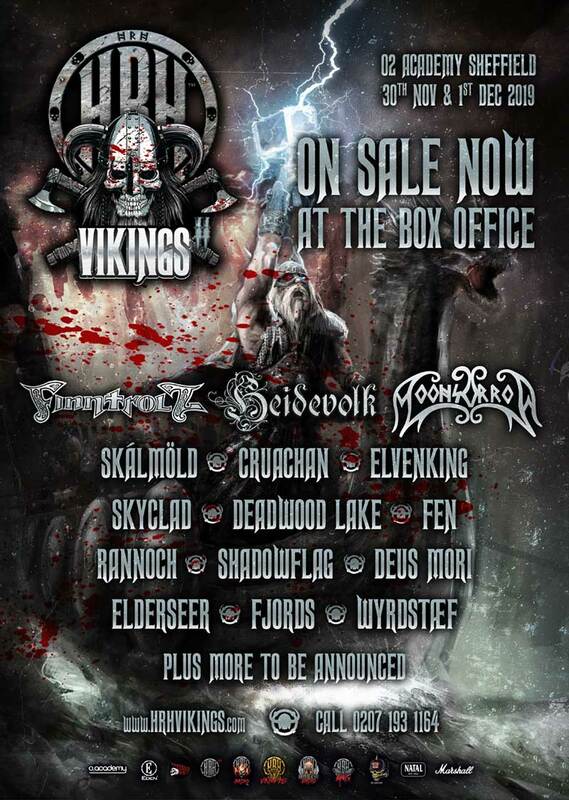 Headlining HRH Vikings II are: Finntroll, Heidevolk, and Moonsorrow – three major Scandinavian bands, with strong takes on folk metal, sung in their native tongues. Finntroll hail from Helsinki in Finnland, and skilfully weave together black metal and folk metal. Like the fearsome trolls of legend, Finntroll embody ferocity and the grotesque. They also blend melodic elements from Finnish and Scandinavian folk music with the brutal, driving sound of black metal. Stirring stuff for HRH Vikings II! Heidevolk, a Dutch pagan metal band, were formed in Arnhem in Netherlands. Back in 2002, as the band’s website proclaims, few could have envisioned the bright future that the Norns had in store for them! The band’s brand of folk metal celebrates pagan life, sacred and profane, drawing on folklore, fronted by trademark tag-team male vocals and harmonies. Moonsorrow are a Finnish pagan metal band, formed in Helsinki in 1995, specialising in what they call “epic heathen metal”. The band are legend for their lengthy songs, long, slow introductory riffs, atmospheric soundscaping and stacked-up power chords with thunderous percussion. A fine trio of headliners to spearhead the HRH Viking II invasion! Also announced in the first wave of fan-chosen bands: Skálmöld (a Viking/folk metal band from Reykjavík, Iceland) – Cruachan (a folk metal band from Dublin, Ireland) – Elvenking (an Italian folk/power) – Skyclad (a British heavy metal band with strong folk influences) – Deadwood Lake (British black metal band, known for melody, atmosphere, and emotion) – Fen (British post-black metal band, from the fens of East Anglia); not to mention: Rannoch, Shadowflag, Deus Mori, Elderseer, Fjords, and Wyrdstæf. More bands yet to be announced! Once again, the O2 Academy in Sheffield will resound to the sound of HRH Vikings: a great venue in the City of Steel, with quality hotel accommodation just an axe’s throw from the venue. The spirit of Valhalla descends on Sheffield in celebration of fierce song, fellowship and revels aplenty. HRH Vikings II will be a 2-day, 2-Arena Adventure, taking place at the O2 Academy in Sheffield on 30th November and 1st December 2019.